Premier League clubs have smashed their own record for combined shirt sponsorship deals, with the 20 clubs generating £281.8 million for the 2017-18 season, a rise of more than £55m on last year. The increase underlines the commercial strength of the League with shirt sponsorships close to trebling in seven years. The combined total in 2010-11, when Sportingintelligence first performed this exercise, was £100.45m. Manchester United’s club-record deal worth £47m a year with Chevrolet remains the biggest deal in the Premier League, and Chelsea’s with Yokohama (tyres) remains second biggest at £40m a year. But Manchester City’s deal with Etihad has leapt to £35m per year via a ‘step increase’ in their contract while Tottenham’s renegotiated deal with AIA has grown even more, also to £35m-a-year. Spurs have finished as runners-up in the past two seasons and will be moving into a new stadium in London soon – both attractive points to sponsors. Liverpool’s deal has also grown with Standard Chartered to £30m a year but that is good enough now only for a top-six place. A majority of the 20 clubs have seen increased deals for the forthcoming season, West Ham and Everton registering the biggest leaps among the ‘middling clubs’ via new contracts with gambling firms. The international appeal of the Premier League is demonstrated with 16 clubs having sponsors with overseas headquarters based in countries as diverse as the USA, China, Japan, Thailand, the United Arab Emirates, Malta, Kenya and The Philippines. Everton recently announced their new shirt sponsor will be Kenyan-based online betting firm SportPesa – the first African company to sponsor an English Premier League club when they did a deal with Hull last season; Hull were relegated but the gambling firm play on in the top flight. Only Liverpool, Southampton, Stoke and Watford boast British-based sponsors. Despite a blanket ban on gambling within football, nine Premier League teams will carry sponsorship from gambling companies this coming season. A new sector of sponsor enters the market at West Brom, now sponsored by Chinese eco-town builders, Palm. (Trivia: West Brom were the first English club to tour in China, in 1978). 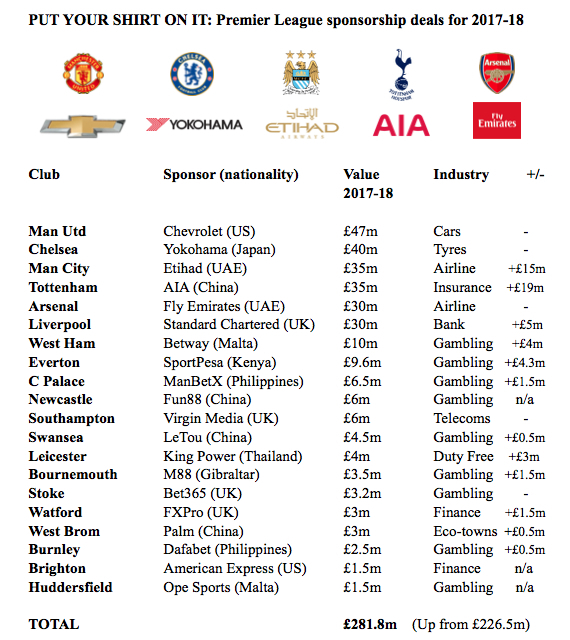 It is tempting to conclude that if you are a ‘big’ enough club with enough clout to attract a major international corporation or business, then your owners would rather stay away from ‘tawdry’ sponsorship deals with gambling firms. But if you can’t get big bucks from a non-betting multinational, then gambling firms are evidently the genre willing to inject millions to boost their market share. All the figures in the table have been sourced from one or both sides of the deals concerned, and all have been run past the clubs for pre-publication checks. Not included in the figures in the table above are new deals for sleeve sponsorship, starting for the first time for 2017-18. Deals are still being concluded but Manchester City’s £10m-a-year deal with Nexen of South Korea is the biggest of its kind in the PL, by far, while Swansea, Stoke, Watford and Huddersfield are among clubs to have deals for sleeves with different firms from their main sponsors. They are typically worth hundreds of thousands per season, not millions. Shirt deals are one revenue stream among many that feed the coffers of Premier League clubs. All clubs earn money from three key streams: match day income (tickets, food & drink, hospitality, programmes, hoardings and so on), media income (mainly TV rights) and commercial income (including sponsors, where shirt income is often but not always the biggest component). Last season, the respective figures were £11.35m and £119.9m, so the ratio was 9.5%. This was the lowest ratio of the period studied. As TV money for 2017-18 will be broadly similar in total to 2016-17 as sponsorship deals have risen by more than 24% year-on-year overall, that will rise again towards 12%.